But cut the writer John Branch some slack. For one the guy is a sports reporter and keeping track of Central Asian “stans” isn’t easy. Also, it’s a really nice piece and he’s done some other amazing stories, including one that won a Pulitzer. Plus he was a good sport about it. Heck, even our Secretary of State gets confused. 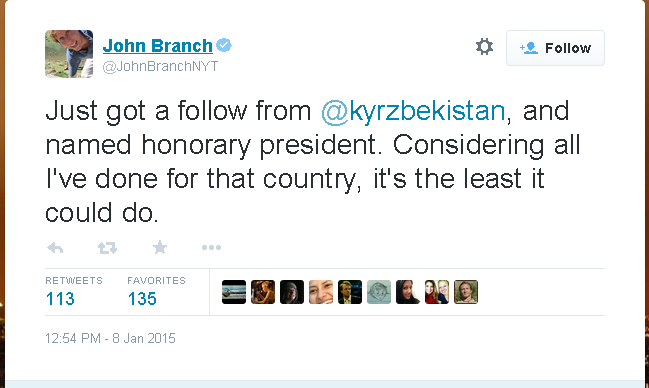 John Kerry insulted not one but two countries by inventing the country of Kyrzakhstan. I mean it’s not like Kazakhstan is of vital geopolitical importance or is seven times the size of Germany or something. Oh, wait, it is? Confusion about the region is becoming de rigeur when running for president. Remember Herman Cain, the pizza guy who ran for the Republican nomination in 2012? Brody: Are you ready for the gotcha questions that are coming from the media and others? Like who’s the president of Uzbekistan? It’s coming. All of this stuff and how are you dealing with that? Obviously – duh. Intentionally fictional fake countries from the region are almost as fun as ones made up by accident. Just to name a few, there’s: Adjikistan, Zekistan (both from video games), Berzerkistan (Doonesbury), Richistan (a very good book by my former colleague Robert Frank), Howduyudustan (Uncle Scrooge), Pokolistan (DC Comics), and, last but not least, Trashcanistan. My very favorite fictional country is Syldavia, the setting for several of Tintin adventures. Readers of the series will have figured out that it, along with its neighbor and sworn enemy Borduria, are somewhere in the Balkans. What only obsessive fans might know is that the Syldavian language is based largely on a Germanic dialect spoken in part of Hergé’s native Brussels called Marols with some Slavic and Hungarian words mixed in and Cyrillic script. Hergé also made up the South American banana republic of San Theodoros ruled alternately by Generals Tapioca and Alcazar (the former renamed the capital Tapiacopolis) and the Persian Gulf monarchy Khemed (fought over by Mohammed Ben Kalish and Sheikh Bab El Ehr). And then there are those made up for purely comic effect. 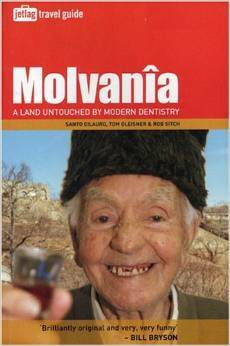 The great series of travel guides from Jetlag Travel that included “Molvania: A Land Untouched by Modern Dentistry” and Phaic Tăn: Sunstroke on a Shoestring” are worth reading if you can find a copy. This entry was posted in geography, Journalism, Stupidity and tagged Borduria, Doonesbury, geography, Herge, herman cain, john branch, John Kerry, kazakhstan, Kyrgyzstan, kyrzakhstan, kyrzbekistan, molvania, new york times, phaic Tan, pulitzer, Robert Frank, syldavia, tintin. Bookmark the permalink.